OXYMORON #3 is a 99c issue on ComiXology which features two stories from the Oxymoron HC – you can buy/download it here and also then read it on your iDevice of pleasure and leisure. And not only should you buy this issue because my story is in it but it’s coupled with the Houston/Allor tale which I love. In fact, it’s my favourite from the book (yep, even better than mine). Also, Paul is a good friend so it’s rad to be in the same single issue as him. I hope you’ll give it a try – two wicked and brutal tales for 99c seems like a steal to me. If you ever wanted to know the lowest lows that Allor and I can sink to, here it is. Note: buying ComiXology books on the website instead of straight through your device removes the 1/3rd cut Apple takes. This leaves more profit for the creative teams and you can go instantly to your iDevice after purchase, find the purchased book under the Purchases tab, and download it for ease of reading later. I recently read an article about finding your muse and busting through writers block. It posits that you need to circumvent your doubtful and analytical editing mind and just write. Find a prompt, it can be literally anything, and just write for 10-20 minutes and let it all flow out. The theory is, this loosens up your brain, let’s the creative juices get flowing, and then you can direct it with force. I dig this idea. And I see merit in it. I think you’d find some very cool story ideas and characters lurking in your brain if you did this. I think you’d be able to stockpile all kinds of weapons for later use that would simply flow as you wrote. I know I’ve dicked about with hashtag jokes and genre mash up ideas before and it’s lead to ideas and stories bursting forth. This sort of tangential thinking really works. This then got me thinking about comic writing. The way you script a page, it’s not always built for flow. There’s too much structure at play – the panel descriptions, designating who says what and in what form – and you can get bogged down in doing that while not just telling the damn story. I also know I try to really structure the flow of the page, panel breaks, page breaks and turns, it’s all vying for brain space while I try to also channel a clear and honest story. If you are stuck on the minutiae of the script and not delving right into the character based story then that can cost you real flow and a good unpacking of rich narrative. Here are some tips I’ve used to really help me blast through the fiddly procrastination that’s all too easy. I don’t indent while I type. I’ve been using Google Drive recently to do all my writing and I love it. It’s been the break from Word I needed to not worry about indenting sections and all that malarkey. Everything just sits on the left and I indent dialogue and captions later using Format Painter, it’s a breeze. Sometimes, I don’t write a page of script but will just write a mammoth discussion back and forth. I don’t even break who says what, it’s clear from what they’re saying who is doing the talking. I write an epic conversation out and let it honestly flow. Then, and only once it is all out, then I edit it. I work out what needs to be said, what can be truncated, or implied, and once it’s sharper and seeing the real point of the scene then I break it into panels. Or, and this happens less often for me, I write an action sequence as quick burst one sentence per visual beat. Once I’ve written throughout all that needs to happen, I edit to find out which specific things the audience needs to see. I’ll find motions can be melded together, or the audience can assume certain progressive motion through the guttering. The important part for me is, don’t get stuck indenting or writing PANEL BLAH – CAPTION when what you need to be doing is riding the lightning of what’s happening in that scene. Plus, I find this a good method of working out all the stuff I need to fit on the page, or pages, and then breaking it up after the fact is easier than flying a little blind depending on how tight your outline is. These tips work for me. They might not for you. You might have something better. But I found when I started writing that there wasn’t enough process work on how to write comics. I’m trying to fix that every day. 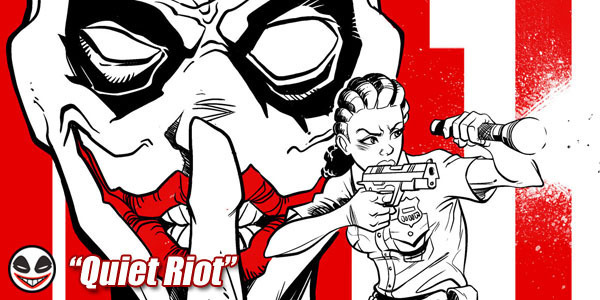 Over on Stefan Delatovic’s site, he reviews the ZERO issue and gives our story a massive shout out. That was nice of him to do. I’ve cribbed the best stuff below. “…the stand out work here is The Many Harold Holts of Space and Time, written by Ryan K Lindsay and drawn by Louis Joyce. I hope the rest of you enjoy it just as much. 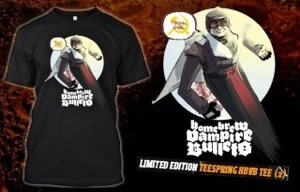 The Jetpack Communism t-shirt drawn and designed by Louie Joyce based on a character created by us in our short ‘The Many Harold Holts of Space and Time’ – who is a future Russian jetpack adventurer version of former Australian Prime Minister Harold Holt – is being crowd funded on teespring.com to aid in printing the first issue of the Home Brew Vampire Bullets anthology on olde timey paper, as well as to just give you something rad to wear and enjoy. It’s only $25 and is on good quality shirt stock. I don’t feel like a creator who can/could/would/should develop much merch but this tee is just too fine, and it’s for a grand cause. For the shirt to become a reality, we need just 30 sales – and we’re already a third there with over half the campaign left to go. If you dig quality tees, this is one hell of a cracking shirt and it’ll help us push some paper copies of this anthology beast into hands at conventions in coming months. I’d appreciate it if you could step up for the cause and treat yourself to Louie’s insane shirt creation fu.